Our vision is to offer fencing, with all its transferable skills for learning and discipline, to a wide range of students across racial, socio-economic, and cultural divides. The Fencers Club’s Schools Partnership program embodies all aspects of the Fencers Club’s mission and goals. It is a comprehensive program that teaches fencing to students in their own schools while imparting the character building values, discipline and strategic thinking that are integral to the sport. 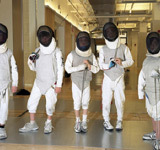 By working closely with students in a sport that is physically, intellectually and emotionally challenging, our highly trained and motivated scholar-athlete coaches will encourage the students to work through difficulties to achieve their goals and develop perseverance that can enhance the students’ ability to perform in non-fencing pursuits. Every child deserves a high-quality, broad-based education, which should encompass a thorough grounding in academic subjects, an introduction to the arts, the fostering of personal growth and rigorous and interesting physical education. Through the Fencers Club Schools Partnership, we seek to partner with schools to facilitate students’ physical, intellectual and emotional growth, especially during highly formative years.